World Translation Center provides professional Indonesian translation services for English to Indonesian and Indonesian to English. We can also translate Indonesian to and from over 150 other languages, including all the principal languages of Europe, Asia, South America, the Middle East and a number of African languages, at affordable rates. Our Indonesian professionals have the ability to provide translation for any project you might have, including marketing materials, technical, financial, legal and medical documents, websites and software. Our experienced project managers will match your project with a translator team appropriate for the field of expertise required. Each individual linguist works solely in his or her own mother tongue and within his or her field of expertise guaranteeing not only quality translation, but proper localization at the same time. After each document is translated, it will be edited and proofread by an additional professional translator to ensure highest possible quality. We also provide transcription, video recording and subtitling services. Should you need to have an existing video dubbed, a commercial narrated or a telephone system recorded, our native Indonesian speakers are available to furnish expert voiceover services. 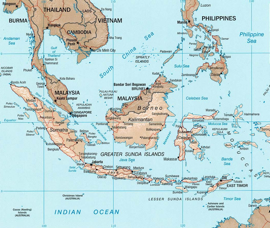 Indonesian is a standardized form of Malay and is spoken throughout Indonesia. Indonesian (Bahasa Indonesia) is the official national language of Indonesia. It is based on a version of Malay from the Riau islands in western Indonesia. It was first declared the official language with the declaration of Indonesian independence in 1945, following the 1928 unifying-language declaration in the Indonesian Youth Pledge. The Republic of Indonesia is the world's largest archipelagic state with 17,508 islands. Almost 100% of Indonesia's inhabitants speak the language. Most Indonesians, aside from speaking the national language, are often fluent in another regional language or local dialect (examples include Minangkabau, Sundanese, Javanese and Balinese) that are commonly used at home and within the local community. Most formal education, as well as nearly all national media and other forms of communication, are conducted in Indonesian. In East Timor, which was annexed as an Indonesian province from 1975 to 1999, the Indonesian language is recognized by the constitution as one of two working languages (the other is English, alongside the official languages of Tetum and Portuguese). During the time Indonesia was a Dutch colony, the Latin alphabet was introduced to write Indonesian. Then, as part of the independence movement in the 1930s, the Indonesian language was standardized and the term Bahasa Indonesia was adopted as the name of the language [Bahasa simply means language]. It is based on a version of Malay from the Riau islands in western Indonesia. Indonesian is written using the Latin alphabet.